The Terowie enterprise was founded by James O'Loghlin and George Dawson. 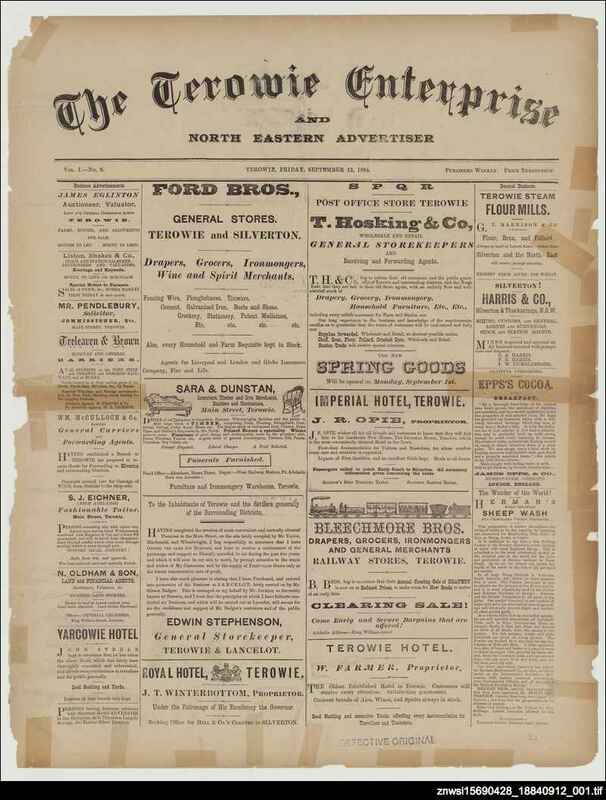 Like many South Australian country newspapers in the late 19th century, the Terowie enterprise saw itself as having a specific role in promoting the development of the town and district that it served. The main concern of the people of Terowie at this time was that the proposed railway link to Broken Hill should pass through Terowie rather than Petersburg (Peterborough). The editor did not shrink from criticising the newspapers of neighbouring towns for their attempts at pushing their own alternative interests. Even after the decision was made that the railway would not go through Terowie, there was still hope that a loop line would be built. An editorial in 1889 reporting that a parliamentary commission had subsequently ruled out even this alternative, proclaimed, 'It is not our intention to let the matter rest...' (8 November 1889, p. 2). However, the drought of the 1890s saw the end to plans of extending the northern line any further than Oodnadatta. With this downturn, Joseph Pengelley, the final owner of the Terowie enterprise, became discouraged and closed the newspaper. He moved his business to Orroroo and founded the Orroroo enterprise claiming, 'The prosperous and thriving look of other places, has at last induced us to hazard a change...' (18 December 1891, p. 2). Politics Many country communities in this period, perhaps particularly in the northern parts of South Australia, were actively interested in the political issues of the time. Perhaps, just 20 years into self government and with a relatively small population in South Australia, the decisions of politicians had more direct effects on ordinary country people. The newspapers of these communities reflected and expressed definite opinions on a range of issues while the people themselves sent deputations and petitions to the South Australian Parliament. Terowie, like several of its neighbours, had a 'Model Parliament' where local men could debate topics of the day. The topical issues of land nationalisation (a socialistic view of land ownership) and the 1894 Pastoral Bill occupy early editorials and letters in the Enterprise. Under the editorship of Joseph Pengelley, there were several attacks on Premier Playford and his government's protectionist policy, under such headings as 'The robbers at work' (14 October 1887, p. 2). Sport Early issues of the newspaper contain plenty of sporting coverage with reports of local football, cricket and rifle shooting appearing regularly. Interstate (Victorian) and city football and horseracing, were also reported. This coverage lessened after the change of ownership in 1887. Morality During Joseph Pengelley's ownership there was much discussion about 'moral' issues. An 1887 editorial titled 'Base immorality' used the strongest terms to attack a family involved with the 'seduction' of a young girl at Petersburg (7 October 1887, p.2). Pengelley also wrote articles against alcohol, gambling, and church interference in politics. Other content With a large farming population, agricultural matters were of interest, a particular concern being the rabbit problem. The Enterprise of 25 September 1891 (p. 3) reports on a public meeting held at Nackara to discuss erecting a rabbit-proof fence. Another interesting feature of the Enterprise was a series of travel articles which appeared at various times. These included 'From Terowie to Western Australia' published over several months from August 1889, and 'From Terowie to Milang' which appeared in May 1890. Original content diminished in its last two years, with the newspaper filling all but one of its four pages with advertisements. Geographical coverage As well as covering news and events in Terowie, there was regular coverage of Burra news. The column 'Burra jottings by Mosquito' appeared in early issues of the newspaper. The towns of Burra and Cockburn continued to have reasonably regular reports throughout the life of the Enterprise, while a number of other towns and areas were less frequently covered. In its first years the newspaper regularly published news from Silverton. Illustrations Interestingly, only one article containing a local illustration ever seems to have been published in the Enterprise. The issue of 15 August 1890 (p. 3) contains a lithograph of the Terowie Institute, together with an article about the history of the organisation. As with most newspapers, small illustrations were regularly used in advertisements, particularly in later syndicated advertisements. Ownership The Terowie enterprise was established by John O'Loghlin and George Dawson. The two men had purchased the printing equipment of a defunct newspaper, the North eastern times, but had no other connection with that title. The partnership was dissolved in July 1886 and O'Loghlin continued on his own until he sold the Enterprise to Joseph Pengelley in January 1887. (O'Loghlin moved to Adelaide and entered Parliament in 1888.) At the end of 1891 Pengelley closed the newspaper and moved to Orroroo.